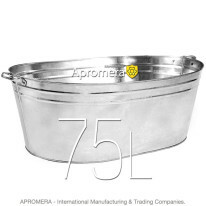 APROMERA is a leading manufacture specialising in fabrication household essentials like Large Galvanized Metal Bucket (Pail) of 10, 12, 15 Liters (with handles). Our Production is available only on wholesale terms and is highly popular in London – UK, Britain. 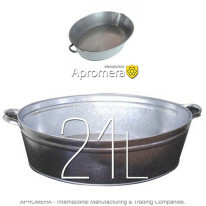 Contemporary design, high-quality materials and reasonable prices make Apromera`s goods perfect for everyday use. Different containers from galvanized steel are made for cleaning rooms and for other household or garden works. Products made from durable metal are equipped with a riveted carrying handle enabling to carry heavy loads. Additional enforcement ribs make our products more resistant to different strains, they are easy to clean and do not absorb odors. 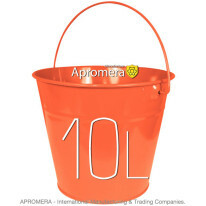 Large Buckets (Pails) 10L with handles are indispensable equipment, traditional tools for any gardener in the UK, Britain. They are used to water plants, carry fertilizers and liquid on vegetable plots, collect fruits and vegetables. Сontainers presented in the catalog are widely used for watering and fertilizing plants in the garden as well as a household essential and when performing construction and repairs. For convenience we equally recommend to have containers of a different volume (from 5 liters to 15 liters) with a lid at your disposal. Large Metal / ZINC. Various construction and chemical solutions can be mixed, carried and stored in them. They are also widely used in agriculture and gardens for preparing feeding and watering plants. Large Coloured Buckets. Most often they are applied for domestic purposes: for cleaning, storing and as a container for vegetables. If you plan to hike in the woods picking mushrooms or berries – a plastic article with a lid is just what you need: it is light, durable, cheap, and will not let contents spill during transportation. 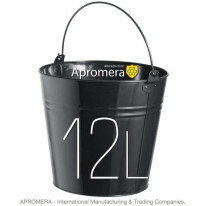 In our catalogue there are also small plastic containers with a belt ideal for picking berries. One of the most important features is the volume, it can vary from 4 to 100 liters. To collect berries a small capacity of 5L will do, it is lighter than others and has a convenient handle making the process easier. Large 90-L containers are used in construction for preparing various solutions. 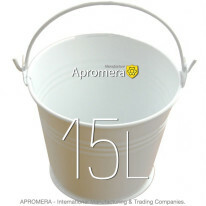 But the most popular ones among gardeners are galvanised buckets of 9L – 12L and 15L – they can be carried individually, and their application is not limited by the garden. The next feature we should pay attention to is a form of a container. 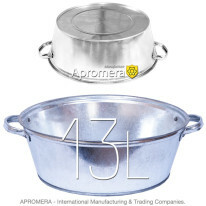 Normally galvanised and metal items and have a circular shape, but their volume do not exceed 20 liters. For painting works. Containers of this form are convenient during cleaning the house. For convenient transportation they may have a cover and different types of handles, which can be located either on the sides to carry with two hands or have an arc-form handle for one-handed carrying. Manufacturers usually choose the second option. Find some more information about the product, read or write reviews and check the prices on the product page. 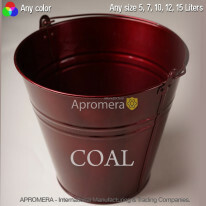 You can buy wholesale production of Apromera manufacture in London UK, Britain . 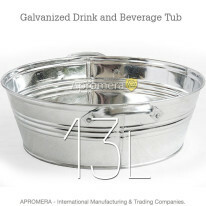 To purchase a Large Galvanized Metal Bucket оr Pail and a Metal Tub you can use a special form in the online store, or make a phone call.